The Junior League of Salt Lake City researched community needs to find out where we can be most effective as an organization. After a vote by the membership, we decided that tackling modern-day slavery would be our newest project, helping combat the world’s second most profitable criminal industry. “We will be working with community partners to determine how best we can attack this problem in conjunction with their efforts,” said Junior League Past President Vicki Harder. There were two films showing at the 2017 Sundance Film Festival that dealt with the issue of Human Trafficking. Salt Lake Magazine published this article, The Mean Streets, regarding the specific issue of women in human trafficking and the Desert News also has also published this Op-ed regarding this issue. Click here to view the article. January is Human Trafficking Awareness month and we will be having a number of awareness raising events coming up. 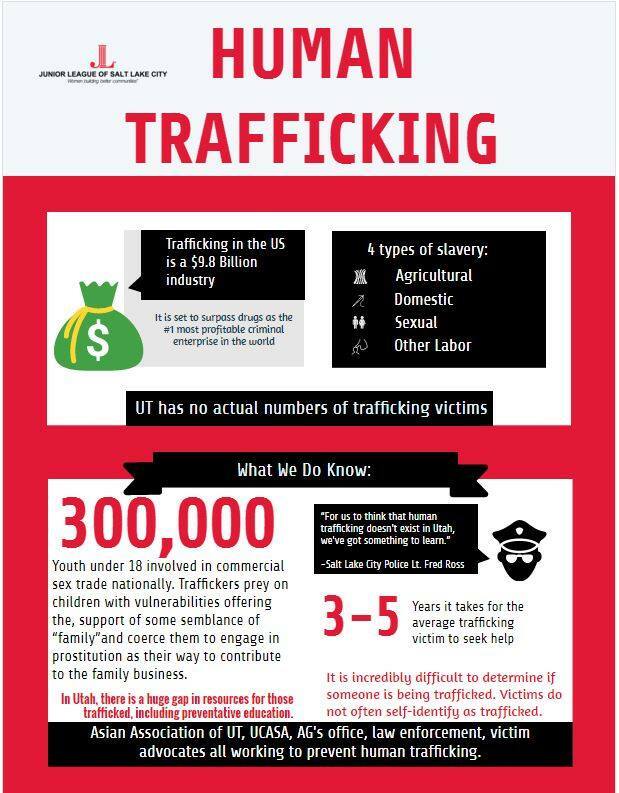 Although human trafficking is widespread, many victims go unnoticed. You can make a difference!